A late post, my birthday was on Sunday and I got to share it with all you lovely fathers out there. A lovely day was had delivering a elmo cake, relaxing, eating and drinking alfresco at my parents house with lovely family and really wonderful friends. Now almost a week later, I am gone on a lovely Lindermans 2007 Shiraz surprisingly brought over by an even lovelier neighbour, tucking into a tub of chocolate ice cream. Wow what a week, better get back into the kitchen and turn the oven on. Re reading this its interesting how many times I have used lovely, maybe that's what happens after the better part of a bottle of red . . . hmmmm. A perfectly pink cake, but it's not cake. It's the ever yummy Rice Krispy Treats covered with fondant. The birthday girl just doesn't like cake . 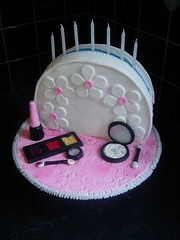 . . even my cake. I made her a castle last year (check it out). I can't believe that its been a year since I made the Starry Castle, wow. 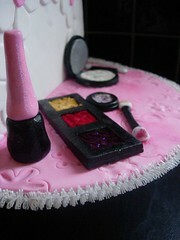 I can not claim this design as my own, the birthday girls Mum was looking through some of my cake books and just loved Debbie Brown's make up case from 50 Easy Party Cakes, so we made the case by I updated the look of the cosmetics, using lots of black colour paste and luster dust, and glitter. Just like my real ones in my case. Well maybe the colours are not quite so bold. And I am more of a green girl, but we can talk about that another day. Debbie's board is a flat colour whilst mine is hand embossed with various sized flowers on pink fondant. I have included the Rice Krispy recipe for you, and it can be formed into just about any shape, very fun. 1. Melt marg or butter in large saucepan over low heat. Add marshmallows and stir until completely melted. Remove from heat. 3. Using buttered spatula or waxed paper, press mixture evenly into 13 x 9 x 2-inch pan coated with cooking spray. Cut into 2-inch squares when cool. Best if served the same day. The brief for this 60th Birthday cake was pretty specific, the birthday girl loves chocolate, loves strong colours and loves native flowers and was happy to oblige. 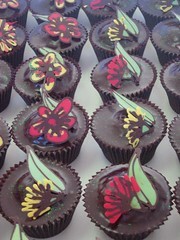 freestyle chocolate Australian Wildflowers, gum leaves and just a touch of green edible glitter. 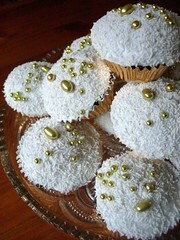 On my blog is edible, especially these Spiced Cupcakes topped with fondant, white jimmies and gold balls. These were made last minute for my Mum's birthday, I seem to spend all my time a creative effort on other peoples cakes, not my own family's. So these were created from what I had in my cupboard, just waiting to be used, my only hurdle was that I had only one egg. Must get those chickens laying again. Very very tasty, perfectly sweet with a cup of strong tea. 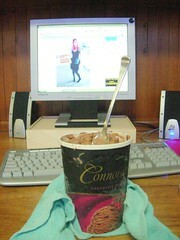 Australia is suffering from drought, not that it looks like it in this picture. 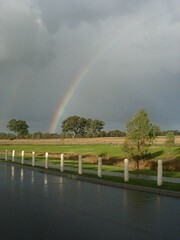 This is the view from out front yard, I think that we are pretty lucky. 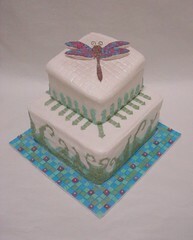 Made for my lovely SIL's 50th, is a mad about Dragon Flies and is an extremely talented mosaic'r so the cake design just stemmed from these two starting points. Bottom layer torted Chocolate Butter cake and Banana cake with Nutella Italian Buttercream. Top Layer torted Chocolate Butter cake and Coffee cake with Nutella Italian Buttercream. You can see more photos on my flickr photostream, I have another mosaic ed cake to post, fingers crossed I'll get it up today. Too long! The decorating started at 8.45am with torted and crumbed cakes, and hour off for lunch and finished at 6.10pm, with me jumping in the shower, scraping the icing off my hands, washing my hair, slapping on some make-up and getting out into the kitchen to take some pictures (boo night photography). To get to the other side of town by 7.30pm. We made it just! Then it was cosmos and blackjack, until 11pm, and a drunken drive home (I wasn't driving) and silly texts to my best friend. Waking up the next morning thinking argh now I have to clean up. Long story to a simple answer, it took about 9 hours. 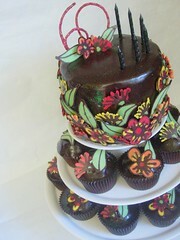 what you get is cupcakes, cakes, recipes, lots of glitter, gardening, chickens, knitting and what ever else takes my fancy . 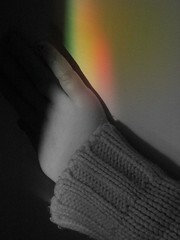 . .
Addicted to . . .